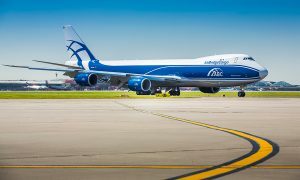 With delivery of the sixth 747-8 Freighter, AirBridgeCargo continues to follow its long-term fleet modernization strategy with a target to serve clients with the most sophisticated equipment. 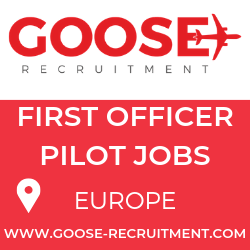 The new aircraft will be used on ABC’s existing route network linking Europe, Asia and the United States via the airline’s hub in Moscow. As from October 17, the new aircraft will join the ABC’s weekly schedule, just on time to provide the market and customers with additional capacity during the upcoming cargo season. 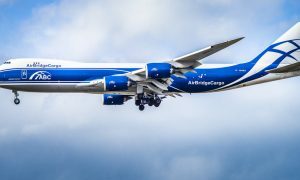 With this addition AirBridgeCargo’s fleet consists of total 13 Boeing 747s, including six Boeing 747-8 Freighters, four Boeing 747-400ERFs (Extended Range Freighters), three Boeing 747-400 Freighters. 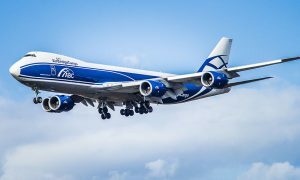 The new 747-8 Freighter gives cargo operators the lowest operating costs and best economics of any large freighter airplane while providing enhanced environmental performance. It is optimized to provide greater revenue cargo-carrying capability than the 747-400, offering 16 percent more cargo volume while keeping its iconic nose door.